This San Marzano Tomato Soup is the read deal! A recipe ‘borrowed’ from a Seattle area restaurant that has a big tomato taste! Washington State is blessed with a wonderful wine country. There are over 690 wineries and growing! 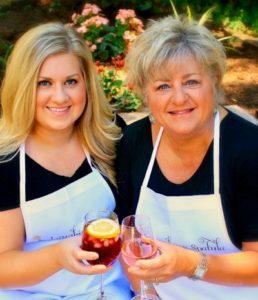 In order for us Seattle folks to enjoy the bounty and not drive the 2 hours over the mountains where the wineries are located – 90 of those wineries have tasting rooms located in a little town just east of Seattle called Woodinville. And here is where the fun begins! There are restaurants, tastings, concerts and beautiful venues to wander while you sip, sip, sip away a rainy Sunday! Sometimes these pirated recipes don’t always turn out, but I’m happy to say, this one was spot on! The secret is canned San Marzano tomatoes – please spend the few extra bucks to get the good Italian kind. I use Cento brand. There is a lot of controversy in the tomato world (like there is one…a tomato world I mean.) on whether there is a real difference in taste between regular canned tomatoes and Italian San Marzano’s. For me – there is. I’ve used both and the Marzano have a deeper, richer flavor and better color. There are some copy cat brands out there. Safeway now carries it’s own brand called “Marzano Type” tomatoes, but I have not tried them. They are considerably cheaper – would love to know if anyone has used them or an equivalent. This makes a big old batch – eat half and freeze the rest. It’s healthy and very low in calorie. Vegan and Gluten free. Use a good extra virgin olive oil. Do not substitute this ingredient. I used an immersion blender but a table top blender may give you a more smoother texture (truer to the restaurant’s recipe). I think this soup is meant to be smoother….I’d like to try my table top blender next time. Looking for more soup recipes? You can see them all HERE! 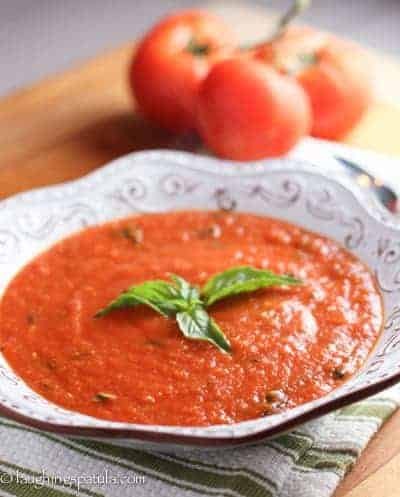 An authentic Tomato Soup that is packed with flavor! Saute onion, garlic and chili flakes in two tablespoons olive oil. Add a pinch or two of salt and cook until soft, about 10-12 minutes. Add wine and simmer, reducing liquid until almost dry. Add tomatoes, 1/3 cup olive oil and sugar. Bring back to a low simmer. Add basil. Salt and pepper to taste. Cook another 10 minutes or so until basil is soft. Serve with additional basil for garnish. This recipe looks delicious. I’m going to try that type of tomato to see the flavor difference. My one question is how you alter this to be Whole30 compliant without changing the flavor. Neither sugar or wine are allowed on the Whole30 program. Thanks in advance! My parents have made this recipe so many times, and they got me to try it last weekend – obsessed! I already made another batch on my own 🙂 Thanks for the awesome recipe! I am so glad! I was just at Purple restaurant in Seattle where I have it every time I visit! I have a sweet white. Would that work or do I need a dry white? Hi Marien – I’d be really hesitant on the sweet wine – depends on how sweet. If it’s a Reisling I’d pass and just go with chicken stock but if it’s a sweeter variety of a dry wine like Sauvignon Blanc then I’d say it’s fine. Hope that helps! Might you have the recipe for Purple Cafe grilled cheese as well?!? Hi Aimee – I do not. So sorry! Kathi, this looks sooooo good, that will be my next pot of soup. And, I love Purple! Thanks for sharing! 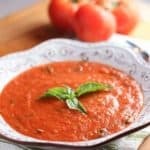 I love tomato soup and this recipe looks so good, Kathi. I agree with you that San Marzano tomatoes are worth the extra cost. All you need is a grilled cheese and this soup would be the ideal dinner for me. Great post! Love you Holly! Chiffonade is a very fancy word isn’t it?? ?